Sandman Motel 3421 Cleveland Ave., Santa Rosa. 707.293.2100. Astro Motel 323 Santa Rosa Ave., Santa Rosa. 707.200.4655. Calistoga Motor Lodge 1115 & 1880 Lincoln Ave., Calistoga. 707.942.0991. L&M Motel 70 Healdsburg Ave., Healdsburg. 707.433.6528. Motels are part of California's car-culture identity. And refurbished, retro-chic motels are becoming part of the North Bay's identity. There is a motel renaissance afoot that takes an existing building and dresses it up in Instagram-friendly colors and pampering amenities. Take the Sandman Hotel. Since its doors opened late last year, the Santa Rosa spot has been popular among younger tourists, who love the funky wallpaper, the pool cabana and the updated reception area. The concrete and stucco structure may strike one at first glance as the classic and uninspiring '80s motel; the interiors, however, are anything but. The Sandman embodies the new formula: a familiar format with boutique upgrades. "Before we purchased the hotel in October 2015, the 135-room Sandman was known as an affordable, family-friendly option in Santa Rosa," says general manager Lauren Bodsworth. "We wanted to embrace being a roadside inn and offer guests a reinvented experience." The owners, Stephen Yang, with Yang Capital, and Greenfield Partners, a private equity group out of Westport, Conn., kept the Sandman name to capitalize on the positive memories many locals have with the location. "Our goal with the renovation is to really embrace our local community, while still appealing to travelers who truly want to capture the essence of impromptu travels," Bodsworth says. To achieve Sandman's contemporary look, New York–based firm Studio Tack used a mix of natural and handcrafted elements, with commissions from local woodworkers who contributed to the hotel's slick minimalism. Illustrator Ty Williams, known for his surfer murals, made the logo and added playful touches throughout the property. Those decidedly photogenic features are on display throughout the hotel: a pink neon sign affixed to the pool fence depicts palm trees that look like waving hands, and bold paintings and rounded mirrors with fringe adorn the rooms. The upgrades are everywhere you look. "The design of the pool house and bar channels a 'tropical meets Californian-bohemian' flair," Bodsworth says. "We wanted the Sandman to have character and be able to offer a unique option in Santa Rosa." At the Astro, the bike-friendly Santa Rosa boutique motel which opened in January ("Ride On," Jan. 18), the premise is similar: an existing building, the original name, a whole new approach. The initiative here belongs to Liza Hinman, chef and co-owner of Santa Rosa's excellent Spinster Sisters restaurant. "We took over the Astro, because we're deeply invested in the Juilliard Park neighborhood," says Camille Canon, who was general manager of the project until October. "It's a unique corner of the world, with an active, creative community. We want to reintegrate the Astro into the neighborhood." The Astro was built in 1963, and the team's goal was to bring it back to its long-lost mid-century modern glory. Local artist Todd Barricklow contributed the circuit-board design for the new railings; Sonoma Tile Makers created the retro orange, mustard and blue tiles in the bathrooms; and concrete artisan Omar Perez of Geyserville Design Parlor cast the concrete vanities. 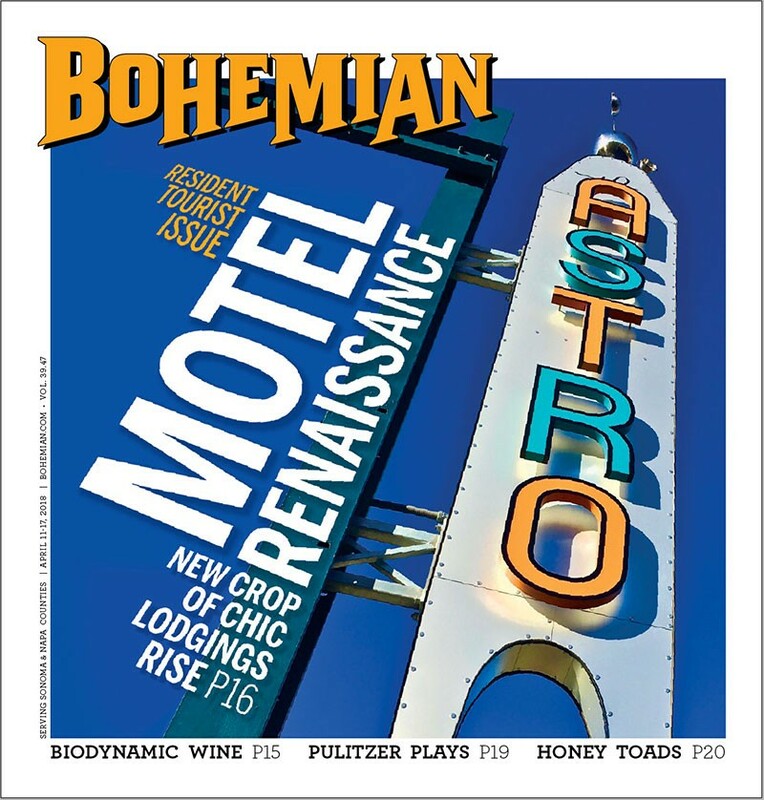 RETRO RECLINERS Motels like Santa Rosa’s Astro have reinvented themselves by looking back. The furniture's net was cast wider, with pieces arriving from all over the country. "As part of our concept, all the furniture in the motel is for sale," Canon explains, "so if you fall in love with the Eames chair in your room, you can take it home with you." Catering to visitors' Instagram accounts is key, says Cannon. "For a project like ours, where there is no advertising or marketing budget and our PR person works for free food at the Spinster Sisters, Instagram is a dream." Room rates start at a $160 at the Astro. Canon adds, "We're looking to attract folks from both the Bay Area and all over the world who want to explore Sonoma County from an affordable, urban oasis in Santa Rosa." In Napa County, the Calistoga Motor Lodge and Spa is the most recent addition to the local boutique motel offerings. Located in a 1940s building (formerly the Sunburst Calistoga), it offers visitors spa treatments in pristine, blue and white rooms, paper moose heads as decor, and tasteful murals. Described as "an epic ode to the great American road trip of the '50s, '60s and '70s," the hotel combines retro chic with new amenities. A bed starts at $140 a night. The temptation to take existing businesses and give them a modern hospitality twist is great as Wanda Marie Brester, who comes from a family of motel owners, attests. Recently, she renovated the L&M Motel in Healdsburg. A stylish neon sign was placed on the exterior, vintage photographs added, succulents planted and the rooms got an update. "I did it all myself," says Brester. "The thought was to make it cozy, comfortable and clean-feeling." Brester removed all the carpet and replaced it with hardwood. Rates start at $110 at L&M. 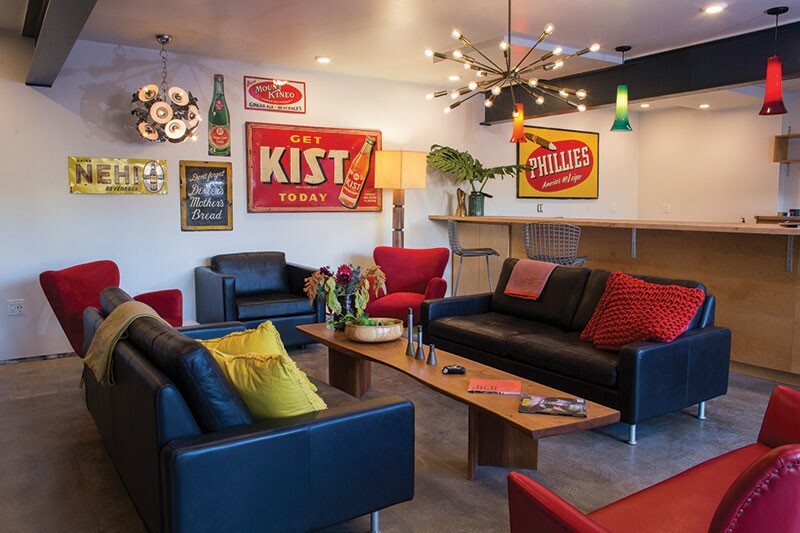 "With the mid-century design and style that is undeniably authentic to Americana, motels are simply cool," says Brester. "It just took almost too long for people to realize what is good and real about these old places. A bunch of franchises and corporate non-soul places had to pop up and make us realize that something is missing. I'm thrilled for this trend." This story has been updated to correct factual errors. Liza Hinman is the chef and co-owner of the Spinster Sisters restaurant and part of the team behind the Astro, not Lizzie Simon. And Camille Cannon is no longer general manager of the Astro. Lisa Robbins is general manager of the motel now.